SIP inflows in the financial year 2017-18 have been 53% more than in the previous year. The total SIP inflows into equity funds and ELSS funds, at nearly $10.33 billion, are substantial even in absolute terms. Monthly flows into mutual funds were consistently negative between 2009 and 2014. However, in the last 4 years there has been a distinct pick up in the flows into mutual funds. This trend has been more pronounced in the sense that a chunk of these flows have come through the Systematic Investment Plan (SIP) route. The chart below captures the SIP inflow trend month-wise in the last 2 financial years. 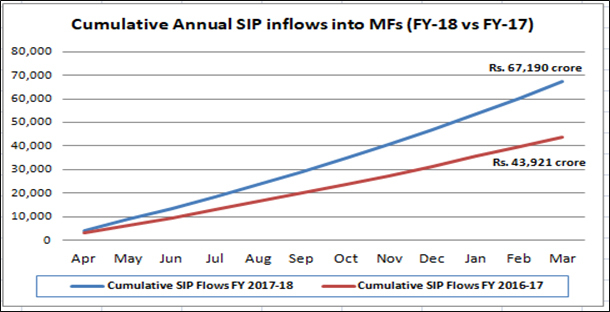 As can be seen from the above chart, the SIP inflows in the financial year 2017-18 have been 53% more than in the previous year. The total SIP inflows into equity funds and ELSS funds, at nearly $10.33 billion, are substantial even in absolute terms. The question now is whether these SIP inflows are actually sustainable and whether they will continue in future. There are 5 reasons why these SIP flows could continue into the future too. A lot of macro level changes have happened in the last few years that have put equity as the preferred choice for Indian investors. For example, the yields on small savings are falling and bank FDs are yielding nearly 2% lower than what they were yielding some 3 years back. Over the last 2 years, the interest rates were falling and so debt funds managed to give capital appreciation. With the rates now looking likely to stabilize or even go up, debt funds are likely to give only at-par returns. Gold and realty have already come under scrutiny after the demonetization and the passage of the RERA Bill. Equities remain the best option for investors at this point of time. In the last 4 years since the beginning of 2014, Nifty has more than doubled. That is an annualized return of nearly 18% on the index itself. Most equity funds and equity fund SIPs have delivered stellar returns in excess of 20-22% in the last four years on a compounded basis. That has happened with little effort from the investors and by just allocating a fixed sum passively to an equity fund on a regular basis. Retail investors in India are finally seeing the merits of an SIP on equity funds, which is evident from the number of folios crossing 2 crore in India. Most investors in India have come to appreciate SIP. You do not worry about timing the market. You can just synchronize the SIP on a particular date and it can be a percentage of your income. Since income flows are periodic in nature, having a SIP creates an easy fit for investors. They do not have to worry about creating a lump-sum, they just allocate passively and the professional fund management takes care of itself. There was a worry that the LTCG tax introduced in Union Budget would dent the demand for equity mutual funds and MF SIPs. That was because all profits on equity funds in excess of Rs1 lakh each year will be subject to a flat tax of 10% without the benefit of indexation. Ironically, the SIP inflows have only gathered steam in the last two months of the fiscal. Why is that so? Most SIP investors have realized that the net impact of the LTCG tax over a longer period of 10-15 years is less than 60bps on a CAGR basis. That is hardly anything when you are looking at the very long term. SIPs remain the most preferred route even after the tax. When it comes to planning for long term goals, SIPs remain the best bet for long term goals like retirement, child’s education etc. That is because the power of rupee cost averaging and the power of compounding get combined in an SIP. It has been amply proven that while SIPs may be volatile in the short term, over the long term they invariably tend to deliver superior returns to the investor. That could swing the deal! Income levels and the propensity to save in India are growing at a rapid pace. With a demographic dividend and an army of young people joining the work force on a regular basis, SIPs are obviously here to stay. Flows into SIPs could well and truly continue.